On Sunday, April 14 2019, the Presplorers visited Buskani, a Lesser Prespa lake shore, with the aim of discovering elements of the shore that change seasonally. Using the amphibious reed harvester, the project field team created a free of vegetation zone which functions as a fire break around the waterbirds colonies in Mikros Kambos area. With PrespaWings everyone can enjoy the exciting experience of birdwatching in the Prespa National Park. 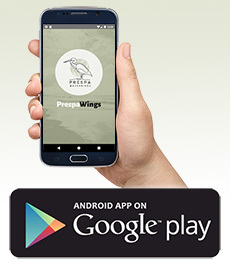 The app is available for Android and will soon be available for IOS too. A meeting was organized by the Management Body of Prespa National Park in order to address the threat of wildfires in the national park. The Great White Egrets started nesting in the colony of Mikros Kampos at the reedbed of Lesser Prespa. Unfortunately, more than 300 ha of wetland vegetation have been burned this spring. With the arrival of the amphibian machinery for reed cutting all the necessary equipment of the project for wetland management has been acquired. A large wildfire burned part of the reedbed of Lesser Prespa, threatening the colonies of the Dalmatian pelicans. The Dalmatian pelicans started to breed in their colonies at the north part of Lesser Prespa. Launching event of the photographic exhibition “Our landscape changes” by the youth club “Presplorers” in the Municipal Library of Laimos. The workshop for responding to disease outbreaks in waterbirds was held in late November highlighting the collaboration of Prespa National Park Management Body, the Municipality of Prespa and the Society for the Protection of Prespa. Cooperation with the Centre for Technological Research of Western Macedonia and local farmers has been established for assessing the use of reed biomass as soil conditioner. Management of the wetland is at full swing! Up to now about 25 ha have been managed and the cut biomass is collected in round bales to be distributed to stock-breeders and farmers. The most important action of the LIFE Prespa Waterbirds project has begun! The SPP field team, equipped with the appropriate machinery, started the management of the reedbed of Lesser Prespa Lake. 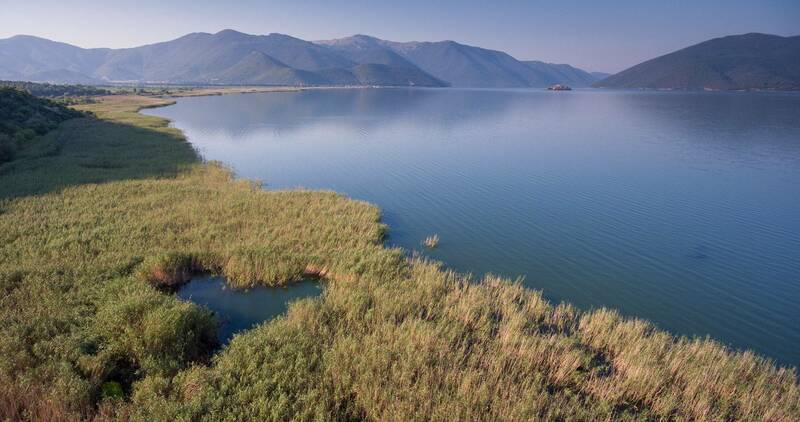 Tour du Valat researchers are working in the reedbeds of Lake Lesser Prespa, and more specifically in the areas where vegetation management will take place this year. The establishment of a sampling network that will be monitored from now on will contribute to assessing the effects of the management actions on the vegetation structure and plant diversity. Water and reedbed management issues were the focus of the networking visit by the Bulgarian Biodiversity Foundation (BBF) and the Bulgarian Society for the Protection of Birds (BSPB) implementing LIFE11 NAT/BG/000362, to the LIFE Prespa Waterbirds team in Prespa. Shooting for the documentary "The LIFE of Birds in Prespa" has begun. Shooting for the documentary "The Life of Birds in Prespa" has begun. The director, Francisco Marquez, has already started filming some of the project activities and taking photos of the nine species. Monitoring of the experimental plots, which were established last year within the framework of Prespa Waterbirds, has started. The results will serve as guidelines for the active management of the reedbeds, while they will contribute to the ecological assessment of the changes that have been observed in the reedbeds of Lake Lesser Prespa in recent years. Yesterday, the first meeting of the Transboundary Wetland Management Committee took place at the Society for the Protection of Prespa, in Laimos. A photography seminar was held at the Municipal Library of Prespa, and was about nature photography and its techniques. The ‘Presplorers’ club came together for its third meeting recently, with Krina once again the starting point. Through pictures, conversations and questions the children got to know the project’s nine waterbirds much better. Other subjects were also discussed while walking the path around Agios Achilleios Island, such as the management actions that will be carried out in the reedbeds, placing particular emphasis on the importance of protecting this special ecosystem. The Society for the Protection of Prespa held a two-day internal meeting on the subject of the course to be taken with regard to reedbed management. The results of the preparatory studies were first discussed and then decisions were taken on the design and implementation of the associated management actions. Plant species assessment was carried out in the inner part of the reed bed and the highest number of observations of species were recorded in sights with shallower water. Τhe activities began with a cycling excursion at the Agios Germanos River mouth for nature exploration and photography! The number of the breeding pairs of waterbirds is estimated by monitoring their arrival and departure in the colony. The assessment of the habitat use of the target species and other waterbirds started on April and will be conducted until June, systematically. The purpose of the Steering Committee is to advise and support the Coordinating Beneficiary of the project, about the conservation and monitoring actions that will be implemented through the project. Field work for the assessment of the dynamics of the wetland vegetation has began! The wetland vegetation advisory group will define the specifications of the targeted surveys and management activities and provide guidance to the guidelines editing team.